Darkly comedic Hollywood crime thriller starring Oscar® nominee Robert Forster, James McCaffrey, Ebon Moss-Bachrach, Zoë Bell, Bill Sage and Dan Hedaya marks directorial debut for Justin Daly, grandson of Academy Award® winner Ingrid Bergman. Opening theatrically Sept. 7, Cinema Village, New York City. HOLLYWOOD, Calif., August 27, 2018 – It’s murder to make a movie in the darkly comedic Hollywood crime-thriller “The Big Take,” opening theatrically Friday, Sept. 7, 2018 in New York’s Cinema Village. Upholding the legacy of film’s finest, director Justin Daly follows in the footsteps of his three-time Academy Award® winning grandmother Ingrid Bergman with his debut directorial film, which will have its World Premiere on Sept. 5th, 2018 in New York City’s Metrograph. Academy Award® nominee Robert Forster (Best Supporting Actor, Jackie Brown, 1997), James McCaffrey (Netflix’s “Jessica Jones”), Ebon Moss-Bachrach (Netflix’s “The Punisher”), Zoë Bell (“The Hateful Eight”), Bill Sage (TV’s “Power”) and Dan Hedaya (“The Usual Suspects”) star in this suspenseful, comedic caper about a blackmailed movie star and an aspiring screenwriter looking for his big break. Their lives become intertwined following a deadly case of mistaken identity. Debuting Director Justin Daly shares, “'The Big Take' is about two people in conflict. One, a movie star who wants to keep things as they are, and one, an aspiring filmmaker who wants everything to change. Set to the plot of mistaken identity, their opposing views not only bring tension, also humor. I think this reflects how I see the world: so much conflict and misunderstanding, and yet it is so absurd how seriously we take ourselves as we stumble around trying to figure why everyone is getting so upset at us. 'The Big Take' is about two people in conflict. One, a movie star who wants to keep things as they are, and one, an aspiring filmmaker who wants everything to change. Set to the plot of mistaken identity, their opposing views not only bring tension, also humor. I think this reflects how I see the world: so much conflict and misunderstanding, and yet it is so absurd how seriously we take ourselves as we stumble around trying to figure why everyone is getting so upset at us. “While the story centers itself on Hollywood, from the inner circle to the outer limits, it isn’t a slight on anything. I’m totally attracted to the classic films of Hollywood, particularly the ones they made regularly: the film noir. New York City’s iconic Metrograph Theatre will host “The Big Take's” star-studded world premiere on Sept. 5, 2018. Justin Daly will be joined on the red carpet by “The Big Take” cast members, including James McCaffrey, Ebon Moss-Bachrach, Oksana Lada, Bill Sage, Dan Hedaya, Slate Holmgren, Tara Westwood and M.J. Rodriguez. Special guests on the night will include Ingrid Bergman’s daughters, Isabella Rossellini and Pia Lindstrom, as well as her granddaughter, Elettra Wiedemann. 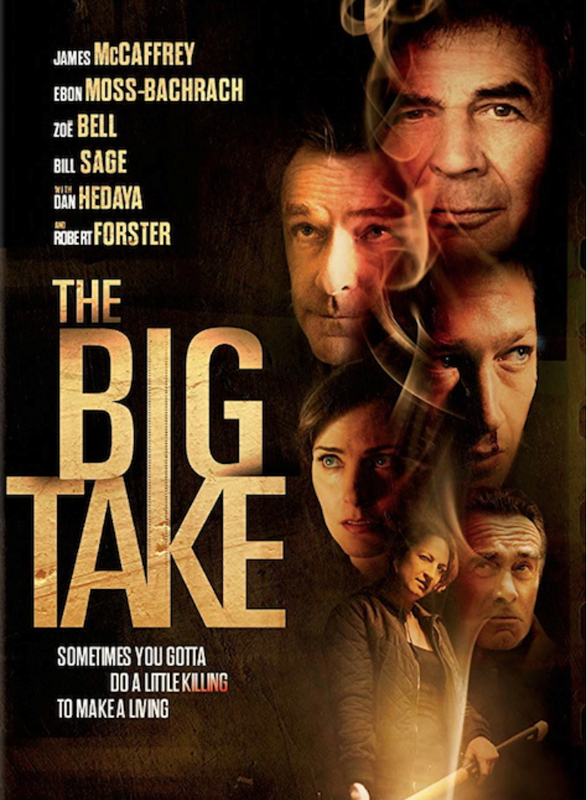 “The Big Take” is also available on DVD and Digital Sept. 4th, 2018 by Archstone Distribution via Sony Pictures Home Entertainment. Justin Daly is an American writer and director. He was born and raised in New York City. He directed his first feature film “The Big Take,” (2018) which was financed through his own company, Federal Pictures LLC. He graduated from Wesleyan University (B.A.) and Columbia University (M.F.A.) He is the grandson of Ingrid Bergman, the nephew of Isabella Rossellini, and the son of Pia Lindström. He lives and works in New York. EDITORIAL NOTES: We are excited to present THE BIG TAKE for your editorial inclusion. Interviews with cast and crew are available upon request.